It was 12 P.M. The sun was tracing an archipelago of fire across the sky. Sweat poured from every pore in my body, tracing little rivulets in the fine dust that had settled over my skin. But it didn’t matter because I had arrived. 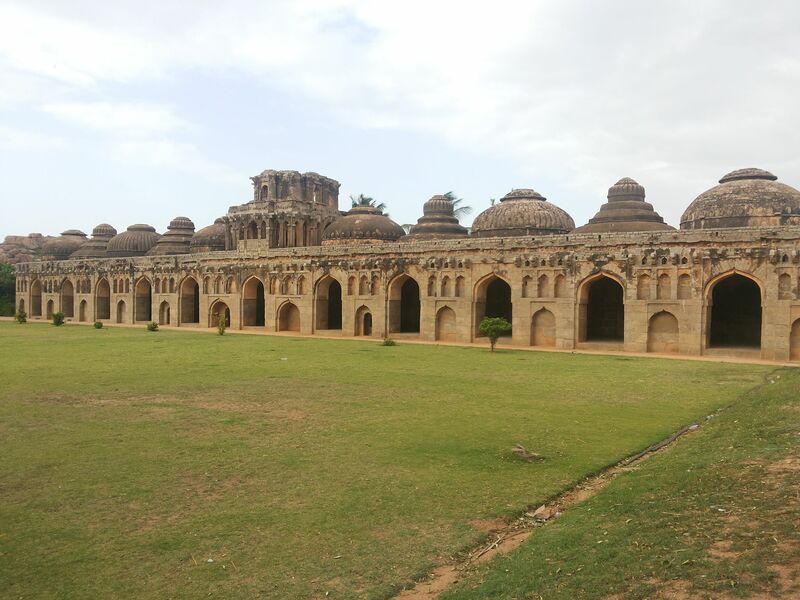 Arrived at an ancient city situated deep within the girdle of stunning granite formations; an entire empire turned to ruins after devastating wars, nestled in the bosom of the Krishna-Tungabhadra Doab, the capital city of the forgotten empire. Arrived, at Hampi. 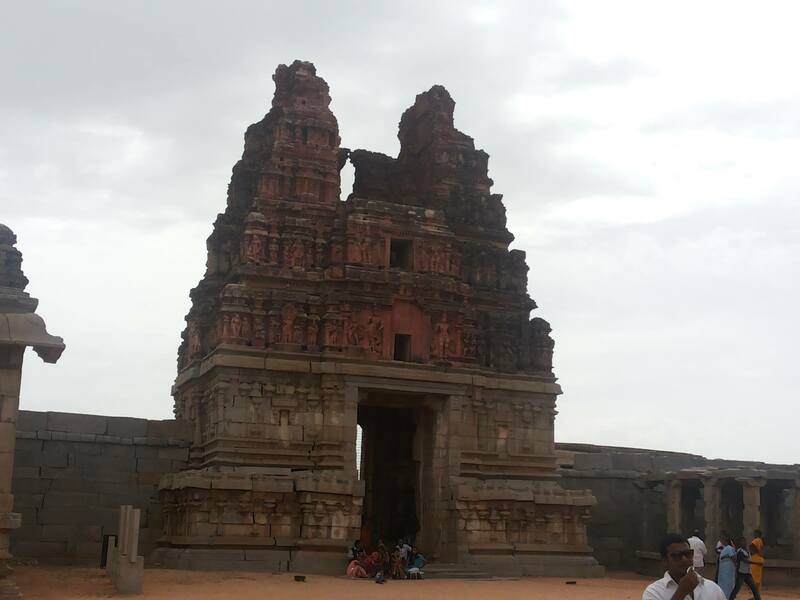 Before I left for college, my parents decided to give me a little farewell present that manifested itself in the form of a trip to the ruins of Hampi, located in the state of Karnataka, near Hospet town in Bellary district. 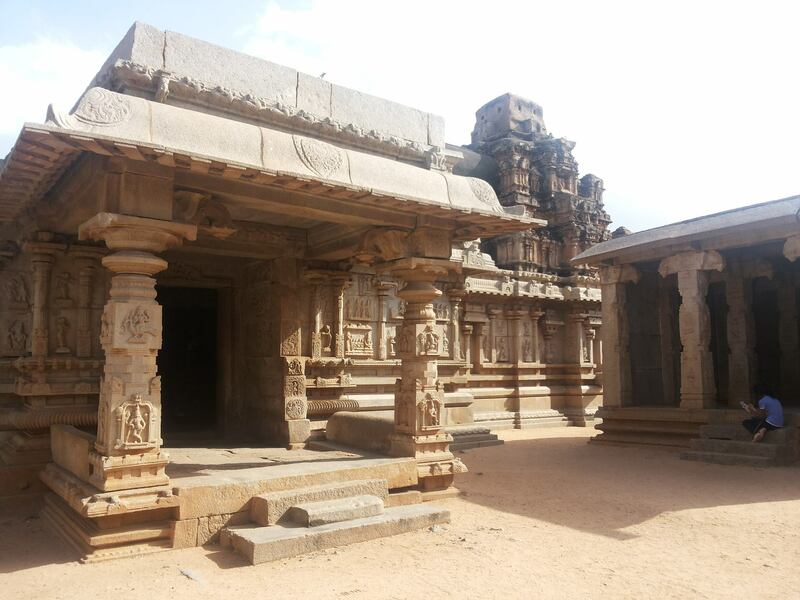 I was more than amenable to this idea seeing as how it combined two of my favourite activities, reading history and travelling, into a quest for exploring the various temples dotting the unblemished terrain that is Hampi, one of the most arid zones in the peninsula. 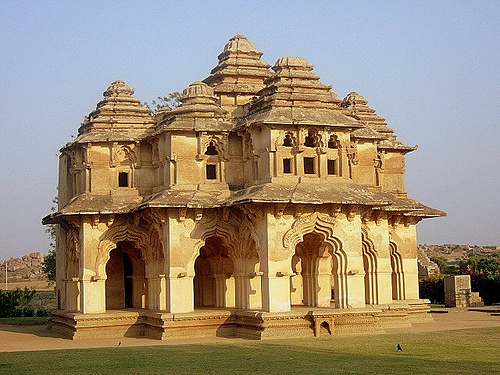 The name Hampi is an anglicised version of the Kannada Hampe, which traces its roots to the local mother Goddess Pampadevi. 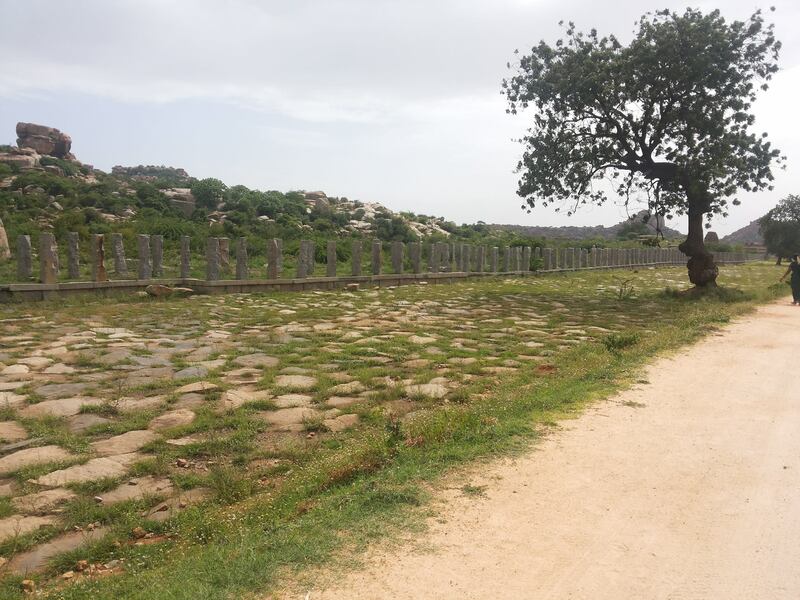 It predates the Vijayanagara Empire and was its capital city until the destruction of the lineage of its rulers, quite an irony when one considers the fact that the empire was considered to be the city of victory. To provide some historical context of the empire before I delve into the nuances of the ruins that remain, Vijayanagara, located on the banks of the Tungabhadra River, was founded by two brothers Harihara and Bukka in 1336. Incidentally, it is also where Kishikinda Parvat is located, the mythical mountain from where Lord Hanuman is said to have come. Empires gain relevance when they are the centres of prosperity and trade. It was the Tuluva Dynasty, which in 1503 replaced the Saluva Dynasty and brought about a golden period for the empire. To be specific, its most famous king, Krishnadeva Raya, was the one who, with his expansionist policies, took the empire to its zenith and with his death, its nadir. During his reign trade flourished, with the kingdom gaining fame for its markets bursting with spices, textiles and precious stones. Indeed, it became a status symbol, a symbol of power and wealth, with visitors being drawn to it in hordes. However, as is wont to happen, with the death of the king the kingdom descended into dark days, a time of chaos from which it would never recover. As the power of the royal throne waned, rising unrest among the populace led to rebellions by the military chiefs, who all wished to grab power for themselves. Eventually other kingdoms established in the region began to look towards Vijayanagara, which led to the formation of an alliance between the Sultanates of Golconda, Bijapur and Ahmadnagar against the Vijayanagara Empire, then led by Rama Raya. In 1565, he led his army against the combined forces of the sultanates but was routed and defeated at Rakshasi-Tangadi, in the Battle of Talikota. In this decisive war, the Vijayanagara Empire fell, and the city of Hampi abandoned to pillage and victorious soldiers, who sacked the city. The first thing that hit me once I alighted from the car was the wind, all 25 kmph of it. It began to subside as we went further in and by the time we reached the first statue, the air had become still, almost suffocating. Sitting within a caveat in the mountainous terrain of Hampi was the Sasivekalu Ganesha. He is named so because of his famous (and mythological) habit of eating mustard seeds. We tried engaging one of the guides at the entrance where this statue is located, but overhearing their unhistorical depiction of wars that never took place, we decided to abstain. Our next stop was at the Krishna Temple, named in honour of none other than Krishnadeva Raya, and built in 1513 to commemorate the conquest of Udayagiri in Odisha and Rajahmundry, in the erstwhile state of Andhra Pradesh. The idol that resides in this temple is that of Lord Balakrishna, part of a tradition of worshipping Lord Krishna as a child of divinity; a tradition steeped in antiquity, being one of the early forms of worshipping Krishna. 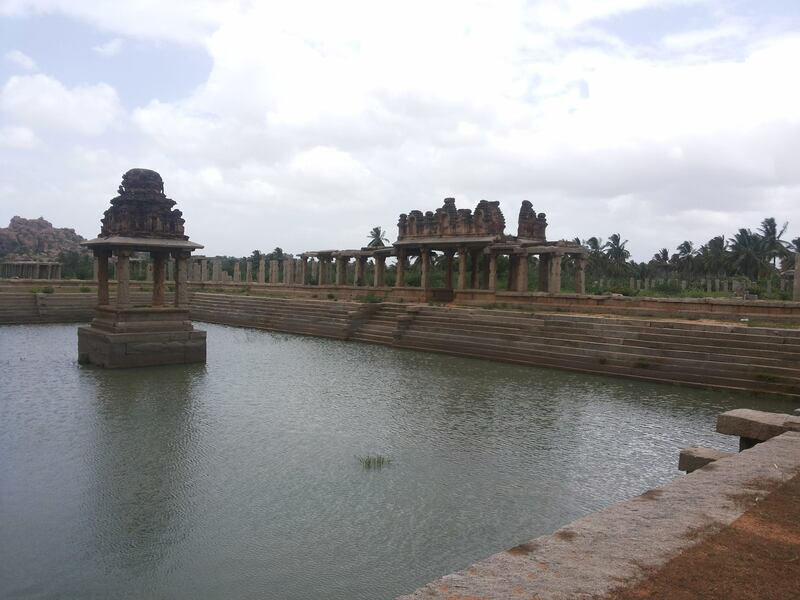 The great Indian tradition of building wells and tanks near temples was religiously followed by the architects of the Vijayanagara Empire with the Pushkarini tank built adjacent to the temple premises. It is a beautiful reservoir, surrounded with the granite hills that characterise the city on one side, and sprawling arid lands on the other. As we continued on the road that led to the Vitthala Temple, one of the two main attractions of Hampi, we encountered short pillars extending toward the sky, in a narrow formation, lining both sides of the road. Enquiry revealed that these were the chariot streets, paved with stone slabs and lines with pillared pavilions where merchants would sit and display their wares. This road, a bustling marketplace in its heyday, led to the Vitthala Temple where the great chariot awaited. The Vitthala temple was the jewel in the crown that was the city of victory. It is not a single building but contains a vast number of shrines, halls and pavilions, all in one temple campus. Built in the 15th century, it is named after Vitthala, a form of Lord Vishnu, who was worshipped in the South by cattle herders and agriculturists alike. An interesting feature of this temple complex is that it wasn’t built at one time; rather different pavilions and halls came up with the advent of successive kings. These halls are covered with an impressive array of sculptures and intensive architectural detailing; each piece of sculpturing can be viewed in at least four different manners, as a bird, a lion, a bear and so on and so forth. The pavilions, or the mandapas as they are popularly known, are the abode of the gods. Here the images and idols of the gods were set to rest so they could witness special performances by dancers, musicians and dramatists. Some mandapas were used for the exact purpose they are used for in a modern context; marriages. But these were holy marriages celebrating those of different deities. Special images made for this purpose were used on these occasions. 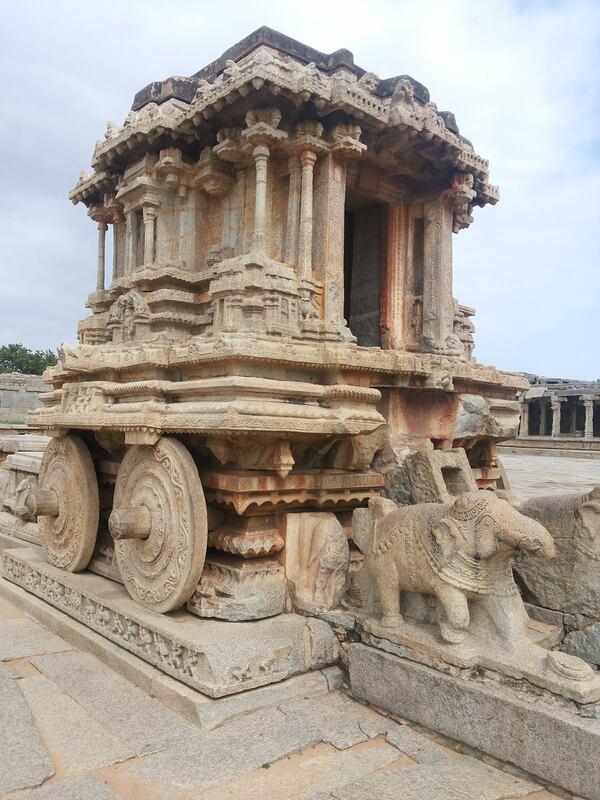 The most iconic structure and what is also considered to be the face of the city of Hampi is the stone chariot in the Vitthala Temple. At first sight, it appears to be a monolith but in reality is composed of several blocks of stone with the joints cunningly hidden under layers of sculpture. The chariot was built to mirror the chariots that were used then, complete with axle and brakes, even if it doesn’t rest on the wheels that are provided. The common misconception that the chariot is just another sculpture is false; it is in actuality a shine to Garuda, the winged God, and the vehicle of Lord Vishnu. This is also why the chariot faces the temple’s inner sanctum. By the time we were done with the Vitthala temple and headed for the royal centre, it was 3 P.M. We could see the land heating visibly, with the air shimmering and tourists foreign to this country wilting. The scenery was a perfect representation of the weather, with little shrubs and cacti springing out of the earth, far more resilient than their greener counterparts. After a few minutes on the road, we reached the Hazara Rama Temple or the temple of a thousand depictions of Lord Ram in the Ramayana. The temple walls are decorated with one thousand panels, all depicting Lord Ram in various phases of his life. Its central location in the royal centre indicates the possibility that its use was only restricted to the king and his family. The temple is built upon pillars of black granite. That along with the low filtration of light and presence of a colony of bats makes the temple seem a lot more menacing than the others in Hampi. The next stop was the Zenana Enclosure nearby which contained the famous Lotus Temple. According to the Archaeological Society of India, this is the place where the women of the harem resided but research indicates that this was not so and that in fact, it was where the war council of the king regularly met. Regardless of its purpose, it is a beautiful piece of architecture, completely different from the architectural style of the buildings we had already visited and was one of the few not mutilated by the marauding soldiers who sacked the city. It is surrounded by large, sprawling and very well maintained lawns, with a pathway that leads directly to the Elephant stables. This is a very large building made of eleven components, presumably to house the royal elephants. The metal hooks, located in the inner portion of the roof, that were used to tie the elephants have been preserved. We spent about an hour here, exploring and napping under the shade of the trees, imbibing the surreal atmosphere of the enclosure. Having read up on Hampi before setting out, I knew exactly what was coming next, and last, in the progression of the temples we were visiting and I couldn’t contain my excitement. We passed by the Mahanavami Dibba, a 40 foot horizontal structure, whose main purpose still remains unknown, although it has been postulated that it was used for processions of the day of Mahanavami. It took us a very long drive to reach the other end of the campus but the archway began to reveal itself bit by bit as we approached. In half an hour, we reached the most beautiful temple in the city. Sitting on the banks of the Tungabhadra, it is arguably the oldest temple in the city. The Virupaksha Temple started out as a small shrine in the 7th century C.E. dedicated to Lord Virupaksha, one of the many avatars of Shiva. The shrine was the culmination of the popular legend of the marriage between Virupaksha and Pampadevi. 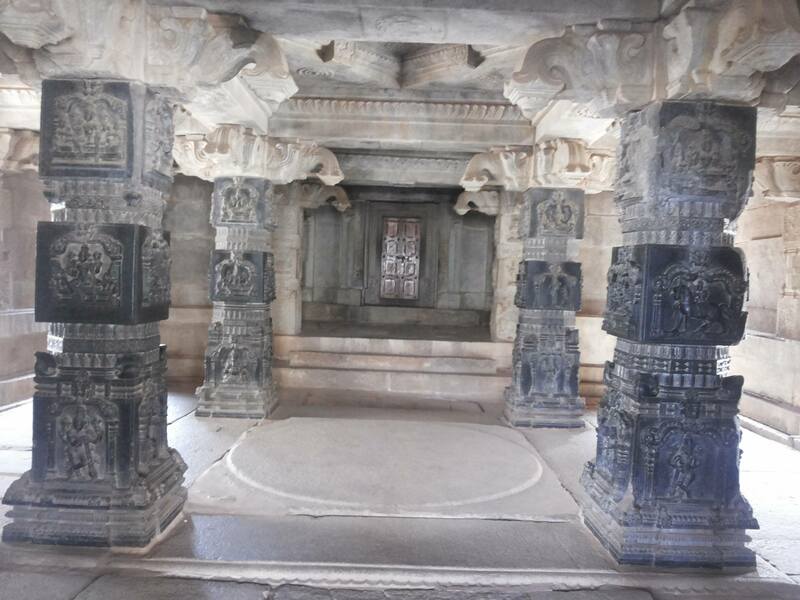 Gradually, with the ascent of the the Vijayanagara empire, kings started to pay homage to this legend, and built various additions to the main shrine. With the advent of Krishnadeva Raya the temple obtained its most magnificent addition, a 50 metre high, 9 tiered gopuram or gateway that can be seen from miles around. It was built as a testament to the king’s power and wealth. The complex also houses an inmate, an adorable elephant by the name of Lakshni, who will pat you over the head with his trunk as a blessing for a coin. Needless to say I fulfilled this along with passing a bunch of bananas to him. With this, and a boat ride across the Tunghabhadra, our day-long visit to Hampi came to an end. The setting sun shone over the Virupaksha gopuram and the shimmering waters of the Tungabhadra made for a beautiful farewell picture. Regardless of the dust covering every pore of my body and fatigue setting in, I can honestly say that this was one of the best trips I have ever decided to go on. Shuchita is pursuing her B.A. LL.B. (Hons.) 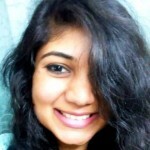 degree from National Law University, Delhi and is currently in her first year. She likes reading books dealing with Indian history and politics. To further her love for writing, she manages a blog here. She is currently interning at the National Commission for Women and Model Governance Foundation.